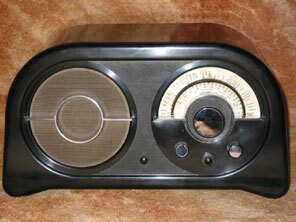 The next classic Ekco to be considered is the AC86 from 1935. The chassis and circuit in the AC86 is not dissimilar to that of the AC85 from a year earlier. Still incorporated is the previously discussed “Noise Suppressor” control and AVC. A continuously variable tone control has also moved to the front of the receiver. The valve line-up is FC4, AC/VP1, 2D4A, 354V, AC/PEN, IW3, the same as the AC85 except that the double diode V914 in the AC85 becomes 2D4A in the AC86, (they are generally interchangeable anyway). At £13.2.0 for brown and £13.13.0 the prices were almost the same as for the AC85. The AC86 is housed in a cabinet designed by Serge Chemayeff. Chemayeff was a Russian émigré, already known in Britain for his design (together with Erich Mendelsohn) of the modernist Bexhill-On-Sea Lido. In fact this cabinet is not wildly different from the early AC85, but it may have been that he had to work around the existing chassis and control layout, thereby providing restrictions to his design brief. The set however looks very good, particularly in the black and chrome version shown. Shown left is the chassis underside. 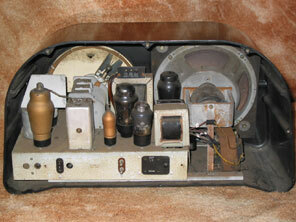 This receiver is fully working, and like the AC85 I have re-built modern components into their original housings. Fortunately when I obtained this receiver not even the wax paper block smoothing electrolytics had been replaced, so I was able to dig out the insides and re-use the cardboard outer to encase modern new components, thereafter re-sealing with wax. Eight other capacitors were also re-built. Having restored the AC86 shown so that it looked totally original both topside and under chassis it sounded terrific, and it was whilst demonstrating it to a friend that disaster occurred. After switch on it sounded great for about a minute, then the sound died. 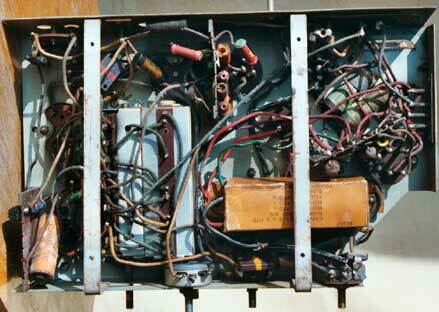 Later checks revealed the HT had gone, and this was subsequently found to be because the output transformer had gone open circuit. I’ve got the receiver working again with another transformer (seen under the speaker top right photo), and to the left the failed component still in place on the chassis. The original transformer is particularly “meaty”, and therefore probably contributes to the excellent sound quality of the receiver. For that reason, and because the rest of the receiver is original, I will probably either have the transformer re-wound or attempt it myself, when time permits!